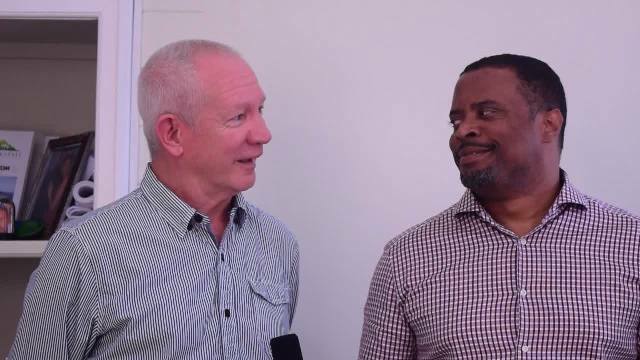 NIA CHARLESTOWN NEVIS (June 28, 2016) — Richard Pavitt, owner of the label Nugene Records and one of the architects of the Nevis Blues Festival says he is pleased with the increasing success of the two-year-old event and described it as phenomenal. He made the disclosure when he met with Deputy Premier of Nevis and Minister of Tourism Hon. Mark Brantley and Permanent Secretary in the Ministry Mr. Carl Williams recently, to announce April 07 and 08 as the dates slated for the 2017 Festival. He also spoke of a change made to ensure the festival’s future success. “This year was a phenomenal success, in my mind. It proved the concept. It excited a lot of people. It provided a festival where people were feeling very comfortable. “The major feedback that we got was this was a relaxed, comfortable festival. Nobody felt at all hemmed in, threatened or intimidated, very, very, relaxed, very friendly. So yes I think we are happy,” he said. The festival spanned three days since its inception, however, the organisers have decided to reduce the festival to two nights. “What we found this latest year was that the Thursday is weak in attendance and what we end up doing is trying to stretch our artists, based on our resources, across three nights. “Friday and Saturday were fantastically successful this year so we want to concentrate all our resources on those two nights. It allows us to be more ambitious in terms of our artists programming in those two nights and make it even better than it was this year,” he said. Owner of the Oualie Beach Resort John Yearwood continues to partner with Pavitt to host the event at Oualie Bay.